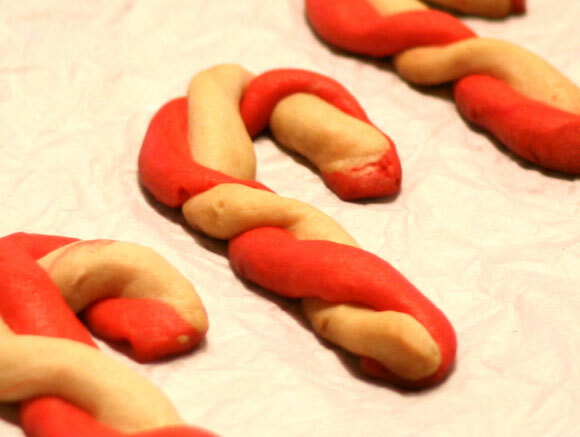 Peppermint Candy Cane Cookies are a delicious Christmas treat! Cream together butter and sugar with an electric mixer. Beat in peppermint, egg yolks and vanilla. Mix in flour until just combined. Mix in red food color to the remaining dough until the dough is very red. Wrap red dough in plastic wrap. Refrigerate the white and red dough for 1 hour. Roll out 1 Tablespoon of white dough and 1 Tablespoon of red dough into 6 inch ropes. Pinch the two ropes together at one end, twist together and bend into a candy cane shape. Place on a lightly greased baking sheet. Repeat with remaining dough. Chill for 15 minutes. Bake until lightly browned, about 20 minutes. Cool on racks.